This entry was posted in Economics, Law, Media, Public Policy, Rights, Tech, The Future and tagged human rights, intellectual property, justice, media, net neutrality, politics, privacy, society, software, technology, telecom, USA. Bookmark the permalink. I understand that there are a number of people abusing the use of internet. However, this doesn't mean that ISP's together with the government has to compromise all of the subscribers. I mean we pay for it, and the contract did not include any boundaries or such which would hinder our freedom to write and speak through the net. Freedom of speech is always under attack. 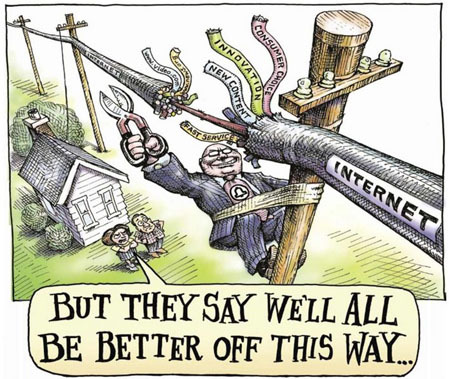 Don't let the GOP give control to the ISPs. We must be able to communicate freely without the ISPs listening in. Would we allow phone companies to censor who we call and what we say? Hell no!! Thanks commenters. I’m optimistic. Either consumer freedoms and privacy will be protected by law, or the markets will move toward technologies that provide the same. We might all have to use encrypted packets routed through anonymous proxies in the future (which would be less efficient), but we will achieve our freedom one way or another.